Home » Giveaway » Giveaway #2 :ScreenCamera, Turn your desktop into a webcam for FREE. ScreenCamera is a cool gadget every user should have installed on the PC. Why? Simply because it is like a part of the operating system that came up missing: ScreenCamera turns your desktop into a webcam and works with your original webcam so you can show and share your desktop and your webcam on multiple video conference calls simultaneously. ScreenCamera can be called a gadget because it is a small yet powerful toolbar with quick access buttons that do all the work of capturing exactly what you want from the desktop very intuitively. You can even use the mouse wheel to zoom in and out on some part of the desktop, you can select a region of the desktop to capture,you can capture the region around the cursor while you move it, you can even capture a window exclusively regardless of its position on the desktop or if there are other windows in front of it. ScreenCamera is designed for minimal CPU consumption so you don’t even notice its presence while you run all your applications. It just sits there ready to do his job and without getting in the way of your favorite apps. 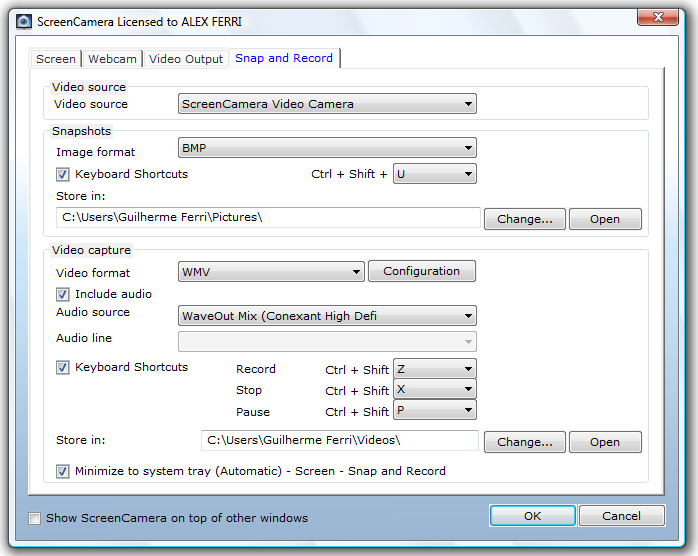 ScreenCamera can be used in a variety of ways: You can use it to record narrated tutorials of screen activity, you can use it to record movies from inside web browsers and media players, you can use it to share and review documents on video conference calls, you can use it do provide remote support by demonstrating on your PC how something can be done, you can use it to share photos and movies, you basically gain a window through which to share your desktop with the World and a webcam multiplier. ScreenCamera has Picture in Picture abilities: On the same video output you can have desktop and webcam showing up together. You can also quick switch from desktop to webcam and vice-versa with the click of a button. ScreenCamera is a must have tool for everybody because as it transforms the desktop into a webcam it complements the user video conferencing experience in a fundamental way. One minute you can share your face, the next minute you can share your screen, or both at the same time if you want. How cool and useful is that? ScreenCamera will run on 2000/XP/2003/Media Center/Vista/Windows 7/Windows 8 and requires at least a 1.3gHz processor and 256mb of memory. Nice giveaway but the results would have been better if you replaced registration by any other. it 😉 I am going to come back yet again since I bookmarked it. this is a great giveaway. sometime i think leave blogging and start participating an giveaway on every site !!!!! !